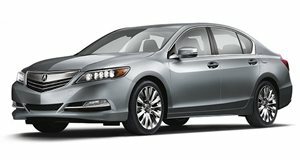 From the moment it debuted back in 2013, it was clear the Acura RLX didn’t even have a fraction of the personality of its iconic ancestor, the early to mid-90s Legend. Even the Legend’s direct successor, the RL, was boring in comparison and yet Acura didn’t learn that lesson when it set out to design and engineer the RLX. Okay, yes, the RLX, is very nicely built and engineered, as is the case with the entire Acura lineup. But it lacks personality. The new Buick LaCrosse is more exciting in comparison. Our RLX tester, which came to a total of $66,870, was the top trim Sport Hybrid with Super-Handling All-Wheel Drive. The SH-AWD system is solid and it’s worth the extra money (otherwise you’ll be stuck with FWD). Power comes from a 3.5-liter V6 with 310 hp and 273 lb-ft of torque, but combined with an electric motor, total output reaches 377 hp and 377 lb-ft.
Fortunately, power is routed to the front wheels through a seven-speed dual-clutch (hooray, no CVT!). There are two additional motors mounted side-by-side between the rear wheels that provide torque vectoring in turns. The overall exterior and interior designs are only so-so, each doing nothing when it comes to breaking new styling ground. Driving impressions? Meh. It’s a comfortable cruiser and it’s not particularly sporty. Why spend nearly $70k when there are so many other (better) luxury sedans out there, such as the BMW 5 Series and Mercedes-Benz E-Class, for similar dough? Acura, we know you’re capable of doing better and it’s about time you should.